English jurist and Orientalist; born Dec. 16, 1584, at Salvington, Sussex; died at Whitefriars, London, Nov. 30, 1654. He was educated at Oxford, and was admitted to the Inner Temple June 14, 1612. He had the use of the valuable library of Sir Robert Cotton, and became interested in Oriental subjects in his antiquarian researches, the fashion of the time seeking the origin of all things in Hebrew antiquity. He was an exceedingly voluminous writer, and was one of the leading jurists on the side of the Parliamentarians in the struggle which led to the Civil war, undergoing imprisonment for his opinions. Almost all of Selden's works quote and refer to rabbinic opinions. Those of special interest to Jewish literature are: "A Treatise on the Jews in England," published in 1617 by Purchas, who curtailed and mutilated it; "De Diis Syris" (1617), the first careful study of Phenician and Syrian mythology; "History of Tythes" (1617), in which he based his heretical views on rabbinic authorities; "De Successione in Bona Defunctorum ad Leges Ebræorum" (1631); "De Successione in Pontificatum Ebræorum" (1636), dedicated to Laud; "De Jure Naturali et Gentium Juxta Disciplinam Ebræorum" (1640); "De Anno Civili et Calendario Veteris Ecclesiæ seu Reipublicæ Judaicæ" (1644); "Uxor Ebraica seu de Nuptiis et Divortiis Veterum Ebræorum Libri Tres" (1646); "De Synedriis Veterum Ebræorum" (1646), a work of which the second part appeared in 1653, and the unfinished third part posthumously. Reprints of these works appeared on the Continent; and till nearly the end of the nineteenth century they were for the outer world the chief sources on their respective subjects. Selden was one of the earliest to deal with the views of the Karaite Jews, in his "De Anno Civili"; and his work on the Jewish woman has been authoritative in all discussions of the subject. In his "Marmora Arundelliania" (1629) he translates a few Hebrew inscriptions. 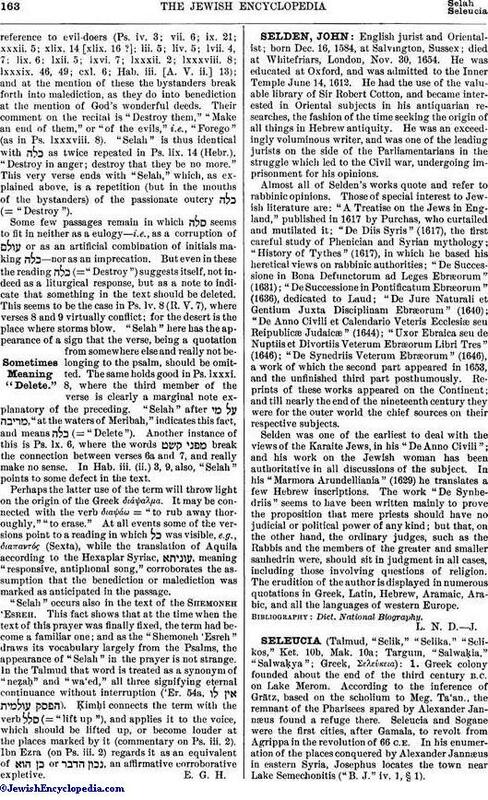 The work "De Synhedriis " seems to have been written mainly to prove the proposition that mere priests should have no judicial or political power of any kind; but that, on the other hand, the ordinary judges, such as the Rabbis and the members of the greater and smaller sanhedrin were, should sit in judgment in all cases, including those involving questions of religion. The erudition of the author is displayed in numerous quotations in Greek, Latin, Hebrew, Aramaic, Arabic, and all the languages of western Europe.